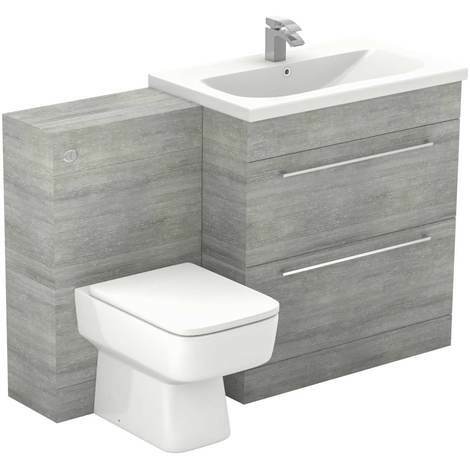 As the largest of our Napoli Vanity unit Toilet Suites, the Napoli Molina Ash 1300mm 2 Drawer Vanity Unit Toilet Suite is the ideal addition to any small bathroom in where you need a massive boost in available storage. This combination seamlessly unites a Molina Ash bathroom vanity unit and toilet unit to create a contemporary, stylish alternative to a traditional basin and toilet. No matter how you want to organise your bathroom the units can be placed at either side to each other adding to its versatility. Its 2 drawer soft close design offers an amazing amount of storage space that any bathroom would appreciate. A modern toilet pan and matching soft close toilet seat, chrome vanity unit drawer handles, soft close drawers and a durable ceramic basin creates a sophisticated look in your stylish new bathroom. Being a large part of our best selling and most popular bathroom furniture range, our Napoli collection has a vanity unit and toilet suite for all bathroom sizes, from floor standing to wall hung furniture in traditional, modern and on trend finishes that maximise the use of space in any bathroom, you can view the Napoli Range here. Taps and Waste not included in this Toilet Suite.